Metal fatigue or a Great Purge? Something is afoot in the AK Party and it feels like a purge. In April, President Erdoğan won a referendum – at least, according to official results – to switch Turkey to an executive presidential system. It was a narrow win, with barely two percentage points separating the two sides and opposition parties dispute its veracity. What isn’t in dispute is that the parties backing Mr Erdoğan’s side, the Yes camp, desperately underperformed in the referendum campaign. The combined forces of the governing AK Party and the MHP, a far-right nationalist outfit, should notionally have been unstoppable, commanding more than three-fifths of the entire electorate. It wasn’t so. A swathe of the party heartland voted against an executive presidency, including AK-controlled cities like Istanbul and Ankara. In conservative Bursa, where AK and nationalist voters account for two-thirds of voters, the Yes majority was slender. Many observers, this website included, explain the unexpectedly strong showing for the No side with voter scepticism: millions in Turkey were not convinced that Mr Erdoğan’s hastily-assembled plans to centralise power were the right thing for the country. That isn’t Mr Erdoğan’s explanation. For him, the near-defeat was because of his party, not his ideas. He has become fond of the term “metal fatigue” in recent months: the AK Party has grown weary after nearly 14 years in power, he says, and must rejuvenate before the next electoral test. That test is the local authority election in March 2019. “Those who believe in our cause and have devoted themselves can offer their resignation to party headquarters, and then we can continue with another colleague,” the president told reporters on the flight back from visiting Iran on Thursday. “There are two ways of removing people from councils: by expulsion from the party, or through misuse or abuse of office. Of course, we don’t want to try these routes. It doesn’t get clearer than that. Mr Erdoğan expects anyone he deems underperforming to fall on their swords upon his word. 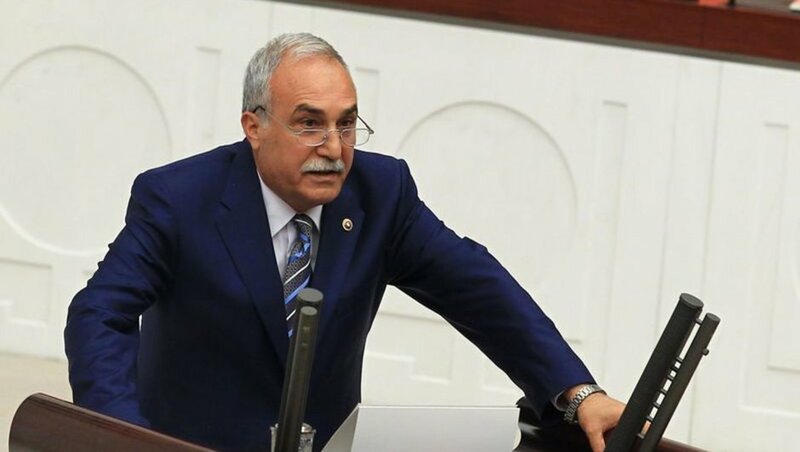 Two such officials – Istanbul mayor Kadir Topbaş and Mehmet Keleş, mayor of tiny Düzce near the Black Sea – have suddenly resigned in the past fortnight. Both were elected to five-year terms in 2014. Both still had a year-and-a-half left in office. Both appear to have indulged Erdoğan’s preference for seppuku. There are rumours in the press, but they are only rumours, that other mayors might be next in the firing line. Star of the gossip squad is Ankara’s Melih Gökçek, who took the helm in the capital in 1994, the same year Mr Erdoğan was elected mayor of Istanbul. Mr Gökçek is a notoriously divisive mayor and despised by some members of his own party. Mr Erdoğan is reported to have twice considered deselecting him before changing his mind. Many believe his time may finally be up. Asked directly about Mr Gökçek’s fate earlier this week, Mr Erdoğan said there were no plans, but added: “That doesn’t mean there won’t be in the future”. Mr Gökçek’s obnoxious, trigger-happy Twitter account is silent on that score. 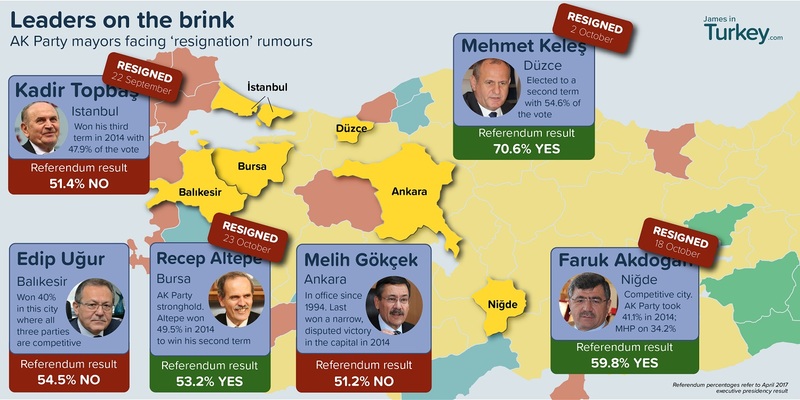 Another target of resignation rumours is in Balıkesir, an Anatolian province where the AK Party, MHP and main opposition CHP were all in with a chance of winning last time around. 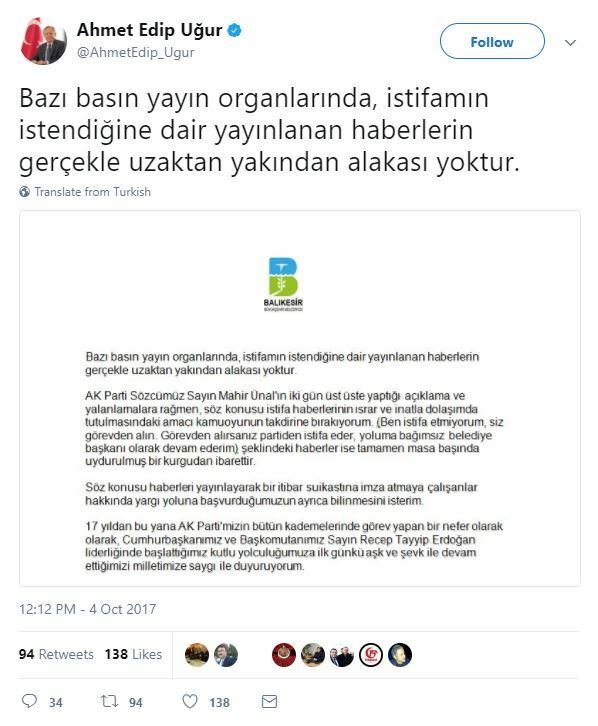 Mayor Edip Uğur took to Twitter to deny rumours that he would sooner resign from the AK Party and see out his term as an independent. The mayors of Bursa and Niğde are also reported to be for the chop, for alleged infractions ranging from poor referendum performance to having related who are indicted for ties to Fetullah Gülen. The trouble for Mr Erdoğan is that Turkish local politicians are the most unruly in the country: having electoral mandates of their own, they can very often ignore the diktat of their parties, or switch to another one. This narrows the ideological gap between the parties. Take the nationalist Mansur Yavaş, who ran for mayor of Ankara on the social democratic CHP’s ticket in 2014 (and won, he insists). Or there’s Ahmet Eşref Fakıbaba, the mayor of Şanlıurfa who loudly stormed out of the AK Party and successfully ran as an independent in 2009. He rejoined the party and became the agriculture minister in this summer’s cabinet reshuffle. And how about the case of Bülent Ateş, who ran for the tiny Liberal Democrat Party in the equally tiny district of Konakkuran in Muş, eastern Turkey? He defeated the pro-Kurdish party candidate in 2014, but switched to that same party nine months later, saying he didn’t actually believe in liberalism and only picked their party because their dolphin logo was easily identifiable on a ballot paper. Of course, the authoritarian winds sweeping through Turkish politics make it harder than ever for independent-minded AK mayors to give Mr Erdoğan the finger and cling to their elected office. For many, the fear of being arrested under state of emergency powers just when their nomination papers are due is a real one: just ask any Kurdish mayor in the southeast. Whether Mr Gökçek or any of his colleagues will follow Istanbul and Düzce with their resignations remains to be seen. But the rumours in the press and Mr Erdoğan’s casual, unguarded remarks make it perfectly clear: a purge of local officials is well underway. The image in this article was updated on 18 October to reflect the resignation of Niğde mayor Faruk Akdoğan and on 23 October to reflect Bursa mayor Recep Altepe’s departure.